Conservation Planning Workshop #6 is titled Managing Workloads in Maine: Endangered Species Act & Cultural Resources. Join the conversation. Share your ideas and experiences with peers during this interactive discussion on what works in the field. Not able to make it? Recordings will be available for download at http://bit.ly/2w6j3Sk. 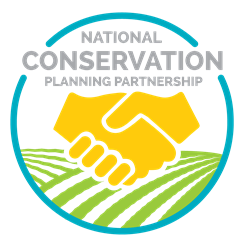 The National Conservation Planning Partnership is made up of the USDA Natural Resources Conservation Service (NRCS), the National Association of Conservation Districts (NACD), the National Association of State Conservation Agencies (NASCA), the National Conservation District Employees Association (NCDEA), and the National Association of Resource Conservation and Development Councils (NARC&DC). The partnership was formed in FY 2015 to emphasize the critical role that conservation planning plays in advancing voluntary conservation efforts on private lands. Since then, NCPP has worked to “Reinvigorate Conservation Planning” by implementing goals and actions that support proven approaches, offer new tools, and expand training to enhance the ability of our workforce to deliver sound conservation planning assistance. NCPP has developed a strategy that ensures our field staff have the right expertise, are stationed in the right locations, and have enough time to work one-on-one with our diverse customer base. We have been working with the help of five sub committees to address training gaps, technology and tools, communication needs, accountability, and policy—to ensure we are meeting our customers’ expectations for the challenges ahead for conservation and agriculture.